Other Children's Tours (scouts, other special group) - please call for details and guidelines. When you first enter the Bennett History Museum, you will be in the Childre Grand Lobby (Longhouse). After paying admission, please sign our guest book. The receptionist will direct you to the Estelle Bennett Hughes Theater to view our award-winning 15-minute film, The Southeastern Indians. After you have seen the movie, exit the theater and turn left to go to the Hall of Ancients at the end of the glass corridor. In this room, you will see dioramas depicting the Paleo, Archaic, Woodland, Mississippian and Historic periods. 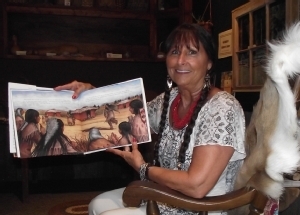 There are interactive exhibits describing the four cultural periods, map selections, an introduction to a "virtual artifact museum," and a primitive skills video. Children enjoy using these touch screens and may need adult guidance. When you have finished touring the Hall of Ancients, return to the Longhouse. 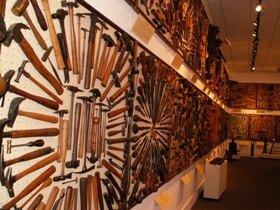 Just past the Bennett Grocery Store display, the Sellars Collection of Historic Hand Tools will be on your right. 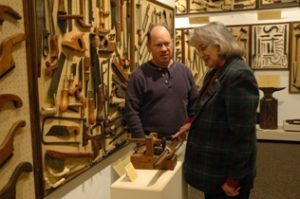 After you have seen the tools, cross the Longhouse where you will find the Rogers Contemporary American Indian Art Gallery. When leaving this area, turn right again. On your left will be the Buffington Gallery. The Appalachian Settlement cabins and blacksmith shop are only staffed for group tours and special events. Visitors who want to visit the Settlement during these events should ask the front desk receptionist for an Appalachian Settlement Guide. On your way to and from the Settlement, enjoy a nature walk on the Lou Reeta Barton Northcutt Walking Trail and Native Garden. Please remember to visit the Bennett Museum Store before you leave. All sale proceeds benefit the Funk Heritage Center. We welcome groups of 15 or more adults for guided tours of the Funk Heritage Center. Adult groups may arrange to have lunch at the W. Frank and Evelyn J. Gordy Center, the campus dining and meeting facility, on the Reinhardt campus. Contact the Funk Heritage Center for details. Picnic tables are available if groups wish to bring their lunches. For an additional charge of $2 per person, our Appalachian Settlement can be a part of a group tour if requested. Adding this element does add a short walk to the tour so please consider the walking capabilities of your group. $ 3.00 additional if Appalachian settlement tour is also included. Call 770.720.5967 to arrange a tour for groups of 10 or more children ages 5 to 12. 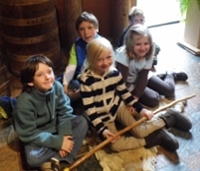 Weather permitting, students will enjoy a hike to the Appalachian Settlement where they will go inside a 1840's log cabin and learn how pioneers lived long ago. 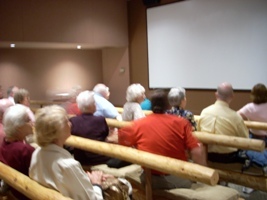 In the Bennett History Museum, they will see a 15 minute film about the Southeastern Indians and tour the museum. Picnic tables are conveniently located next to the facility. Weather permitting, Native American and pioneer games may be added to the tour. A make and take craft is included. $9.00 per child (plus sales tax, if your group is not tax exempt). One adult chaperone is required for every ten (10) children, and that chaperone is admitted free of charge. One adult is free per 10 children. We appreciate your scheduling a field trip to the Funk Heritage Center. We hope you will have a wonderful learning experience. Thank you for your cooperation and enjoy your visit! 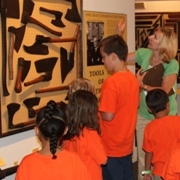 The Funk Heritage Center is pleased to offer guided tours for our growing home school population. This opportunity is available for groups of 15 or more home school children plus their parents. Please visit the link for school trips to find out information about our tours offered/admission fee (plus tax) for students and to determine which tour you are interested in taking. Reservations are required at least three weeks in advance with pre-payment for guided tours. Appalachian Settlement tours are available for groups of 30 or more with a $3 additional fee. 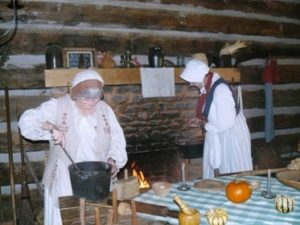 The Georgia History Timeline program is held in October and Pioneer Days is held in May. 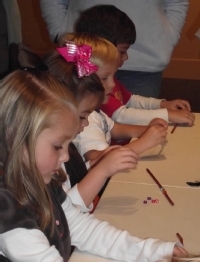 Homeschool students may join a group of elementary school classes on a space available basis. These programs are held in the Appalachian Settlement and they are also excellent opportunities for home schooling families to expose their children to our outdoor history programs. 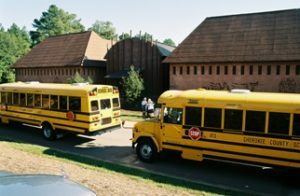 If you have questions concerning our home school programs or to schedule a tour, please call Riki Poarch, our School Activities Coordinator, at (770) 720-5969. Below, children look at a model of a Creek Indian village. Pioneer ladies demonstrate life in the 1840's. 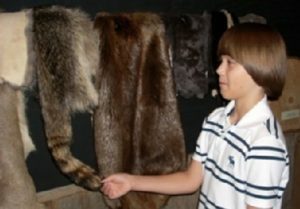 In the Hall of Ancients, a child learns about animals that live in Georgia. Below: Preschool children participate in story time and crafts and children from a child care center tour the Tool Gallery.